The Regis School of the Sacred Heart celebrates Mass on a regular basis in the spirit of Sacred Heart Goal I (a personal and active faith in God) and Goal IV (building community as a Christian value). This year, Ms. Tara Carnes, Regis music faculty, has transformed the Music Ministry to maximize student participation ensuring that everybody is fully involved in the worship. 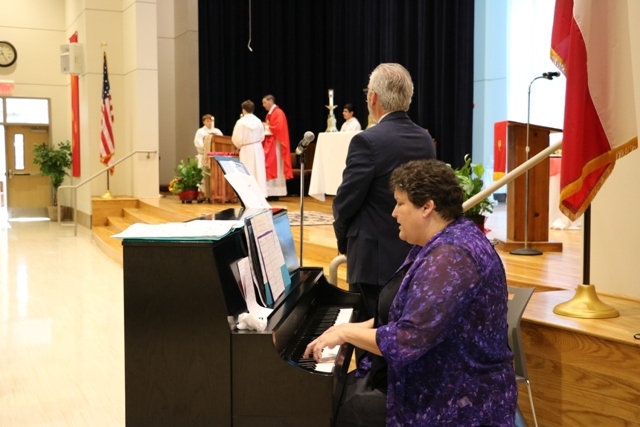 Ms. Carnes has worked with students, faculty, and administrators to increase community participation in the Mass by developing student cantors, including student musicians as accompanists, and by increasing the size of the chorus. Ms. Carnes works with a small group of cantors at recess and study hall. Currently, the boys are focused on the psalms with parent and faculty cantors facilitating the rest of the liturgy. In the future, she hopes to cultivate a cadre of student cantors who can lead the entire Mass. Regis students have embraced these new opportunities to develop their spiritual life by singing for others and indicating how important these leadership opportunities are. 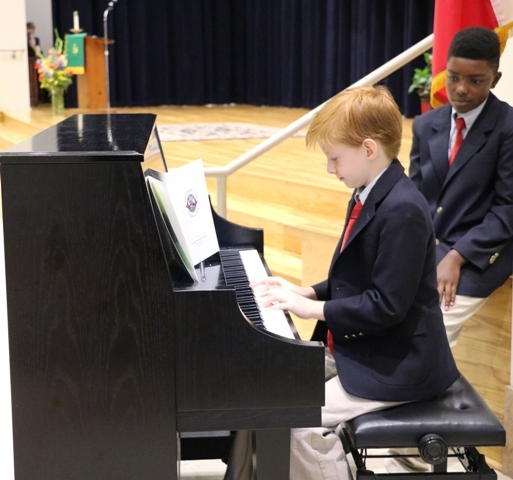 Ethan Tastard, third grade cantor, remarked that being a Music Minister is important to him "...because I can help lead others to be closer to God." There are many talented musicians who take private lessons and this year, several of them have shared their gifts by playing the piano, drums, guitars, violins, and handbells. These students have played instrumental preludes as well as accompaniments during the Liturgy. The chorus is also a growing group in the Regis community that includes several faculty members along with the students in grades three through eight. Eighth grade student, Pablo Lloyd, shared that "...by singing I can help lead others who might be reluctant to sing." Ms. Carnes notes that the chorus meets every week on Wednesdays at 7:00 a.m. and new attendees are always welcome. At morning assembly, Ms. Carnes leads the entire school community in song practice. The purpose of these daily sessions is to help the boys become comfortable with a wide body of music. 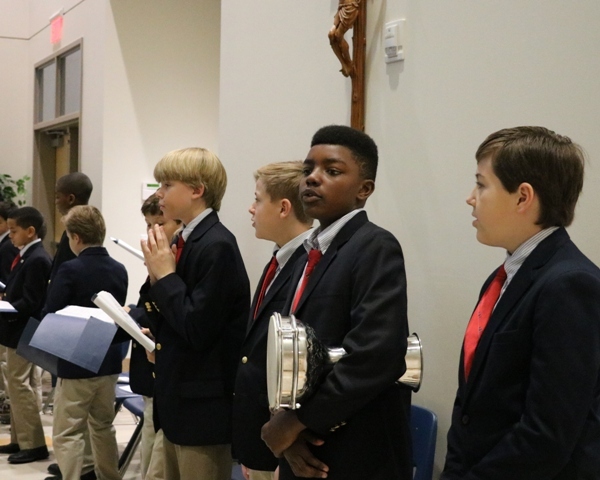 Ms. Carnes explains that, "Boys are good at music and singing and finding ways to engage them and to give them opportunities to participate helps in their religious formation." Ms. Carnes feels strongly about the importance of a dynamic, boy-centered music ministry and shared, "Music is the way that I find God and music is praying twice so it's a way to connect with God. Music was the thing that engaged me in the church as a teen and I know teens are very interested in their spirituality – even if we don't think they are." 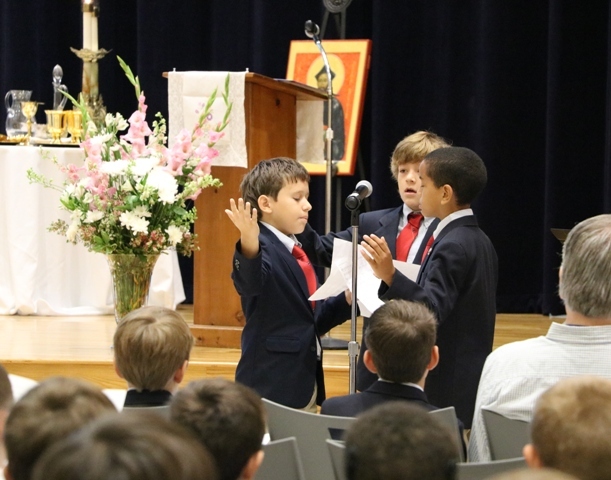 Ms. Carnes has hit an important note with this transformation of the Music Ministry at Regis and Santi Moretti, fourth grade student, summed up the value of this growing ministry by saying, "Singing songs are like prayers to God."